Perfect Gift for the young adventurer of every age – a new classic! Hardcover 8.5“ x 8.5” with AudioBook in CD format included. A charming picture book to read, again and again, with rhythmic charm to delight young and old. As in the tradition of the timeless tale, Wizard of Oz, this wonderful book starts with delightful black and white illustrations and ends in a celebration of blazing full color. 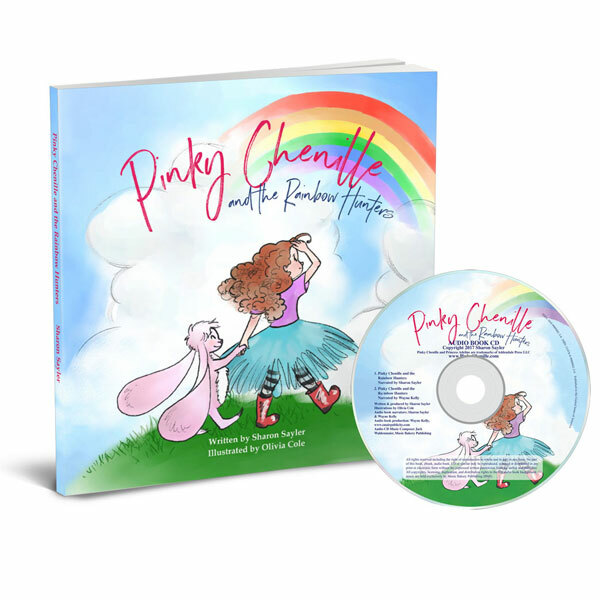 Pinky Chenille and the Rainbow Hunters is a charming rhyming picture book for young adventurers and peacemakers of every age. With engaging, whimsical art and playful rhyming verse, Pinky and the Princess weave a fantastical tale of inspiration on the importance of getting along, friendship, and teamwork. As in the tradition of the timeless tale, Wizard of Oz, this wonderful book starts with delightful black and white illustrations and ends in a celebration of blazing full color. This delightful book is perfect for children ages 3 to 8, teachers and storytellers, kids’ books enthusiasts, other ‘worlds’ aficionados, playgroups, and parties! Sayler’s book is a beautiful celebration of persistence, cooperation, and self-discovery to share with someone special—young and old alike. As a children’s author, Sharon Sayler’s passion is to show through fun and creative storytelling great values and life lessons in a playful and easy to understand way. Sharon’s work as a corporate communications expert has refined her belief that if our children are to create change in the world, they need to have early exposure to diversity, getting along, empathy, persistence, and understanding that each person has individual characteristics that make them unique – and that’s okay….